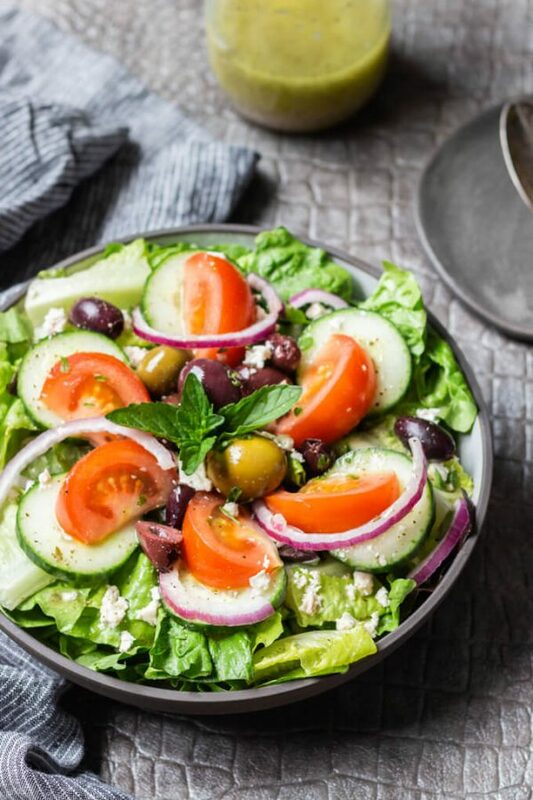 This traditional Greek salad of crisp lettuce, sweet tomato and cucumber, briny olives, salty feta cheese, and lemony Greek vinaigrette is an upstate NY favorite. Anyone who dined in a Greek restaurant in upstate NY during the 1980’s and 90’s will recognize this refreshing salad. 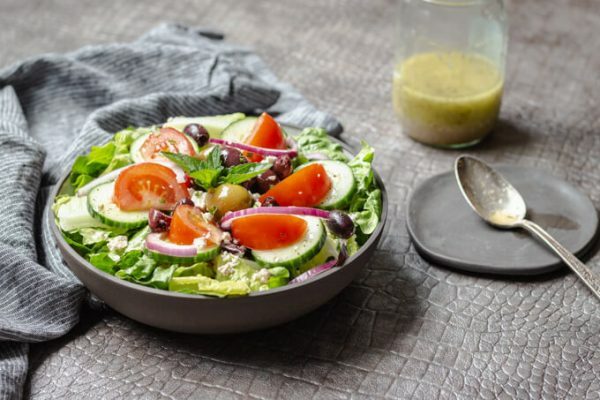 Crunchy greens, salad veggies, briny olives, and salty cheese dressed with a tangy dressing, this will always be my standard for Greek salad. We eat a lot of salads in the summer. 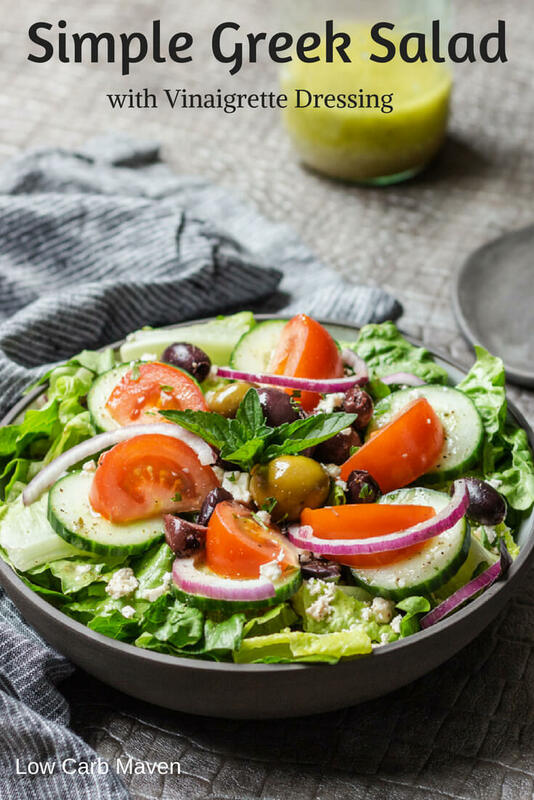 While popular salads like the Cobb, Taco Salad, or Chicken Caesar feature regularly on our menu, this traditional Greek salad recipe is one of our favorites. The simple ingredients make it a great accompaniment to marinated and/or grilled meats. 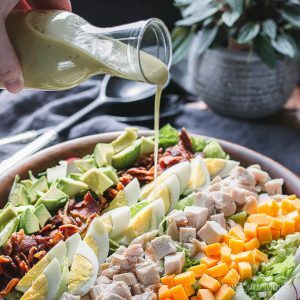 Start with crisp iceberg lettuce (or romaine) and tear or chop into into bite-sized pieces. Layer the lettuce with fresh tomato, cucumber, red onion, Greek olives, pepperoncini peppers, and feta cheese. 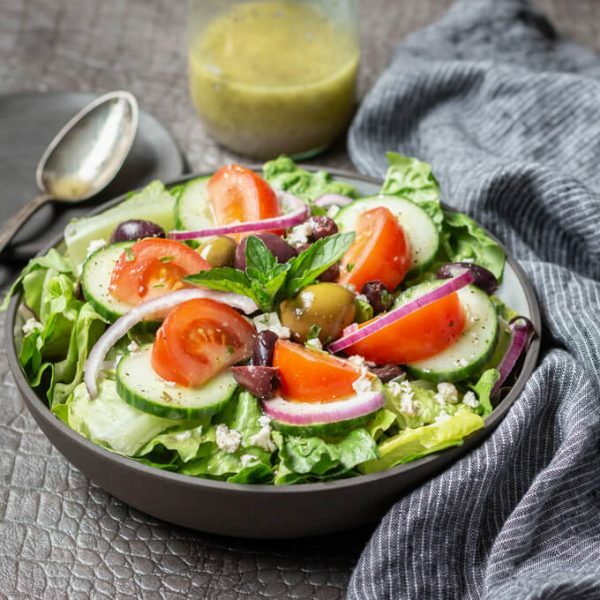 Toss with a simple homemade Greek vinaigrette dressing. The base flavor of this lemony Greek vinaigrette begins with lemon juice and olive oil. Garlic, shallot, oregano, and marjoram add a Mediterranean feel and a little sweetener helps balance the flavors. Vinaigrette, or oil and vinegar, salad dressings are some of the easiest dressings to make. Just measure the ingredients into a lidded jar and shake to combine. To emulsify, use a cheat like dijon mustard, honey, or raw egg yolk and some patience with a whisk. To force a vinaigrette to emulsify without an added cheat, use immersion blender to combine ingredients. NOTE: Since this is a low carb blog, I use an erythritol based sweetener (Sukrin :1) in the recipe. If you are not following a low carb or ketogenic diet, use honey, or sugar per your taste. 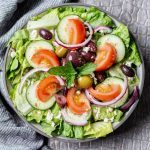 Each generous serving of this Traditional Greek Salad is 5 net carbs! Wash the lettuce, chop or tear, and place into a large bowl or 4 individual serving bowls. Slice the cucumber, tomato, and onion. Arrange evenly over the lettuce. Top the salad with the remaining salad ingredients. Spoon dressing over or toss and serve. Serves 4, at 5 net carbs each. 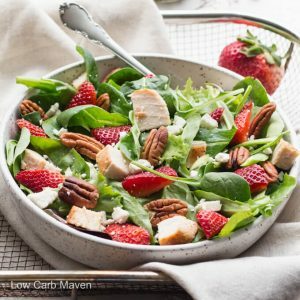 Is balsamic vinegar keto friendly?